Kira Cochrane chairing a 2014 Southbank Centre panel discussion on how austerity affects women. 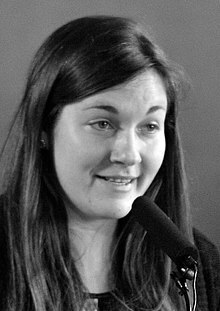 Kira Cochrane (/ˈkɒkrən/; born 1977) is a British journalist and novelist. She currently works as Head of Features at The Guardian, and worked previously as Head of Opinion. Cochrane is an advocate for women's rights, as well as an active participant in fourth wave feminist movements. Kira Cochrane was born and raised in Loughton, Essex. Cochrane and her younger brother were raised by her mother in a single parent household. Her father died of a heart attack in 1979 at age 34; Cochrane was two years old. In 1983, when Cochrane was six years old, her elder brother was killed (age 8) in a traffic accident. She attended Christ's Hospital school, Horsham before studying American Literature at the University of Sussex and the University of California, Davis. Formerly a journalist at The Sunday Times, Cochrane fills the position as current Head of Features at The Guardian. She was the newspaper's women's editor from 2006 to November 2010, when she was succeeded by Jane Martinson. Cochrane wrote a column for the New Statesman magazine from 2006 to July 2008 and has written occasionally for other news sources such as the HuffPost. Kira Cochrane has published four novels, Modern Women 52 Pioneers (2017), All The Rebel Women (2013),The Naked Season (2003), and Escape Routes for Beginners (2004), which appeared on the long list for the 2005 Orange Prize for Fiction. In 2009, Cochrane herself appeared on the judging panel for that year's Orange Prize for Fiction. She's co-edited (with Eleanor Mills) Cupcakes and Kalashnikovs: 100 Years of the Best Journalism by Women, published in the United States as Journalistas: 100 Years of the Best Writing and Reporting by Women Journalists. She has also edited an anthology of women's writing, which has appeared in The Guardian, Women of the Revolution: Forty Years of Feminism. "I wanted each woman to be someone who shifted the world's sense of what might be possible for women." "Kira Cochrane's 'All the Rebel Women' collects the voices making up a new fourth wave of feminism. In this exclusive extract, she looks at the role humour has to play in the movement." In her second novel, Kira explores her narrative through the eyes of 13-year-old Rita Mae. Rita questions her parents toxic marriage and wishes to escape the prison-island she resides on. Throughout the novel, Rita uncovers secrets about her family's past. Escape Route for Beginners landed Cochrane as the youngest author nominated for the Orange Prize for Fiction, at 27 years old. Cosmopolitan calls it, "Inventive and deliciously dark." "An outspoken, outrageous, original and outlandish debut novel from an outstanding new writer. Growing up isn't easy when your mother is a figurehead for feminism and the most famous lesbian in the world. All her life, Molly Flynn has been intrigued, entertained, alarmed and exasperated by her mother Augusta's increasingly bizarre claims about who she is and where she came from. Now, as Molly sets off down America's West Coast to confront her estranged husband and serve him divorce papers, she looks back on her strange and unconventional childhood in a series of entertaining flashbacks. But Molly will be waylaid on her journey from Seattle to California, and sidetracked - with dramatic, surprising, hilarious and unexpected results." "Welcome to the fourth wave of feminism. What's happening now feels like something new again. It's defined by technology: tools that are allowing women to build a strong, popular, reactive movement online. Just how popular is sometimes slightly startling." "As 2013 unfolded, it became impossible to ignore the rumble of feminist campaigners, up and down the country." "But bald attempts to silence women only made the movement larger and louder. They convinced those who had never thought about misogyny before that it was clearly still alive, and convinced those who were well aware of it to keep going." ^ a b "Kira Cochrane". Simon & Schuster. Retrieved 2 September 2013. ^ "Kira Cochrane". The Guardian. 7 March 2017. ^ "Kira Cochrane". the Guardian. Retrieved 21 February 2018. ^ Cochrane, Kira (10 December 2013). "The fourth wave of feminism: meet the rebel women". the Guardian. Retrieved 21 February 2018. ^ a b c d "Interview: Kira Cochrane – Journalist and Author - The Heroine Collective". The Heroine Collective. 13 March 2017. Retrieved 21 February 2018. ^ Mslexia - Issue 43 Retrieved 2016-10-20. ^ Cochrane, Kira (26 February 2011). "Darin Strauss: Two cars, two deaths". The Guardian. Retrieved 21 February 2014. ^ Panel, The (13 October 2014). "Do ghosts exist? Four theories on our fascination with apparitions". The Guardian. Retrieved 21 March 2018. ^ Cochrane, Kira (14 May 2012). "Letter: 'Michael Butler gave me a glimpse of a different kind of politics, based on care and commitment'". The Guardian. Retrieved 8 October 2017. ^ "Kira Cochrane". Facebook. Retrieved 21 February 2014. ^ Martinson, Jane. "Speaker Profile: Jane Martinson, Journalist". Speakers for Schools. Archived from the original on 26 February 2014. Retrieved 21 February 2014. ^ Cochrane, Kira (3 July 2008). "And it's goodbye to all that..." New Statesman. Retrieved 21 February 2014. ^ Cochrane, Kira (7 March 2017). "The Women Who Inspire Me Are The Ones Who Put Themselves On The Line". Huffington Post. Retrieved 14 December 2018. ^ Kerrow, Kate (13 March 2017). "INTERVIEW: KIRA COCHRANE – JOURNALIST AND AUTHOR". The Heroine Collective. Retrieved 21 March 2018. ^ Cochrane, Kira (2017). Modern Women: 52 Pioneers. London, UK: Frances Lincoln. ISBN 978-0711237896. ^ Cochrane, Kira (2013). All The Rebel Women. Guardian Books. ISBN 9781783560363. ^ Cochrane, Kira (2003). The naked season. London: Pocket Books. ISBN 9780743492485. ^ Cochrane, Kira (2004). Escape routes for beginners. London: Simon and Schuster Ltd. ISBN 9780743478427. ^ "Orange Prize for Fiction 2005". The Guardian. Retrieved 21 February 2014. ^ Sponsorship & Entertainment (21 April 2009). "Orange Prize for Fiction announces 2009 shortlist". Orange Prize for Fiction newsroom. Retrieved 21 February 2014. ^ Mills, Eleanor; Cochrane, Kira, eds. (2005). Cupcakes and Kalashnikovs 100 years of the best journalism by women. New York: Constable & Robinson. ISBN 978-1845291655. ^ Cochrane, Kira; Mills, Eleanor (2005). Journalistas : 100 years of the best writing and reporting by women journalists. New York: Carroll & Graf. ISBN 9780786716678. ^ Cochrane, Kira (2012). Women of the revolution : forty years of feminism. London: Guardian Books. ISBN 978-0852652275. ^ "All the Rebel Women: exclusive Guardian Shorts ebook extract". The Guardian. 16 December 2013. ^ a b "Kira Cochrane". Simon and Schuster UK. ^ Cochrane, Kira (2004). Escape Route for Beginners. ISBN 978-0743252256. ^ Cochrane, Kira (2003). The Naked Season Kira Cochrane. ISBN 978-0743441032. ^ Munro, Ealasaid (23 August 2013). "Feminism: A Fourth Wave?". Political Insight. 4 (2): 22–25. doi:10.1111/2041-9066.12021. ^ Sollee, Kristen (30 October 2015). "6 Things To Know About 4th Wave Feminism". Bustle. ^ a b Cochrane, Kira (10 December 2013). "The fourth wave of feminism: meet the rebel women". The Guardian.